Unless you’ve worked in the industry before, you probably don’t realize the amount of time and effort it takes to make a video look good. In addition to time, video production requires experience, skill, and a considerable amount of technology. 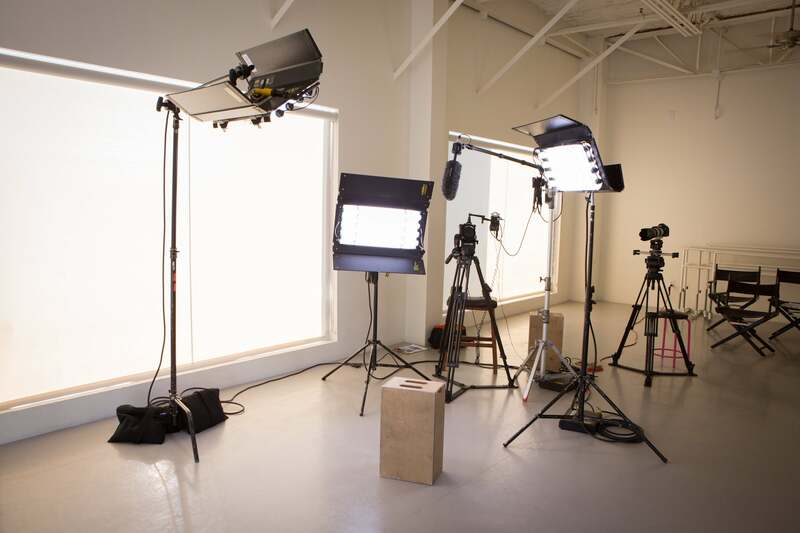 You need cameras, lighting equipment, and audio gear to create an effective, engaging video. In some cases, special rigs like sliders and jibs may be brought in as well. If you’ve never participated in an on camera interview before, it may be intimidating to walk into a room full of big, bright lights, a boom microphone, heavy-duty cameras, and a video production crew of people you are not familiar with. But don’t worry, there’s no reason to be alarmed, everyone and everything in the room is there to make your job as the interviewee as easy as possible. All you have to do is relax and be yourself! We’ll take care of the rest. Below is an example of what a typical interview setup may look like. Now that you’re more familiar with what the final product looks like, let’s examine a few of elements of the Frozen Fire interview video production process. To make the process easier on you, and to boost production value, we typically film with at least two cameras. This allows our editors to cut seamlessly back and forth between different shots and angles of you speaking, just in case you happen to stumble over a word or two. This also means you don’t have to be perfect. You aren’t Leonardo DiCaprio or Meryl Streep. We’re not expecting an Oscar winning performance, so don’t hold yourself to that standard either. The first camera, unsurprisingly referred to as Camera 1, is used for a wide, sliding shot, whereas Camera 2 is stationary and films a closer shot. Try your best not to let the sliding motion of Camera 1 distract you from answering the interview questions. The slider shot gives the final video some nice movement to enhance visual appeal and maintain viewer interest. Watch this video we produced for a printing company. At the 1:00 minute mark, you’ll notice as the camera angle slowly changes while the woman speaks (this is Camera 1). Then, a few seconds later, you can see the woman again from a closer, fixed shot (this is Camera 2). Before the on camera interview starts, we conduct a series of tasks to make sure we’re ready to begin. The first thing we need is for you to clap once loudly, directly in front of your face. This will allow us to sync the audio and video recordings together when we edit later – this is similar to what you’ve seen in the movies where they close that black and white slate. Action! Next, we’ll ask you to say and spell your name, along with your job position or title. This ensures we spell your name correctly on your lower third graphic. 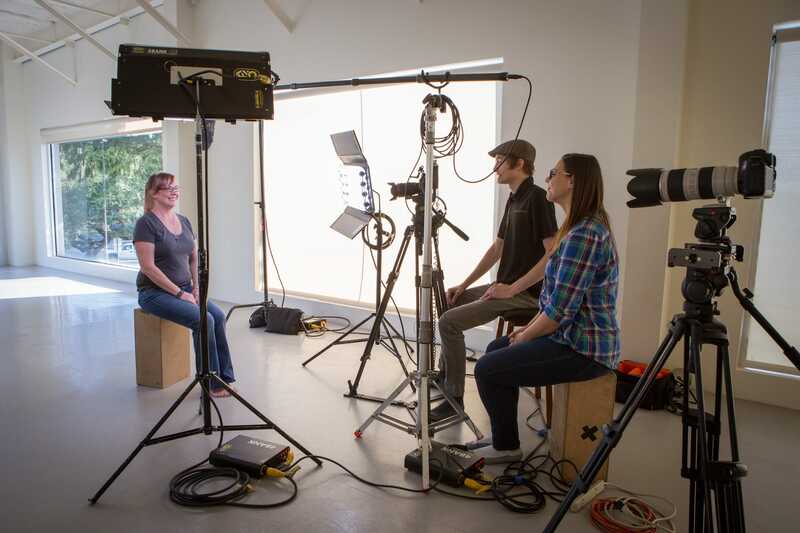 During the on camera interview, one of our team members will sit right next to the camera. They will be asking you the questions and prompting you to speak. When answering, try to rephrase the question in the beginning of your response. For example, if we ask you, “What is your favorite color?” Don’t answer “Red!” Say, “My favorite color is red.” The viewer of the final product will not hear the questions, so we want to provide context to your answers. While we film, hold your gaze on the interviewer, not the camera, the walls, the floor, or the ceiling. On camera, wandering eyes can make you look unsure of yourself and what you’re saying. The best method is simply to talk with your interviewer as if you were holding a conversation with a friend. If you stumble over your words or want to rephrase something you said, that’s perfectly fine. Finish your sentence or train of thought, and we’ll circle back if necessary. We will re-record your answers a few times to make sure we get the best take. Frozen Fire is here for you; we’re going to make you look good! The main thing to remember is to be confident, energetic, and sincere. Call us at 214-745-3456 to get started on your next video project!